TIAL-TUM one-piece heat-shrinkable casing is specifically designed for complete joint protection of pre-insulated pipelines for underground laying.One-piece structure of the casing allows to execute waterproofing that meets the highest requirements, though the installation is carried out in a simple way which does not require high qualification of field crew. This one-piece structure eliminates the need of additional end seals. TIAL-TUM is manufactured of HDPE via extrusion process followed by specifically oriented stretching to obtain shrinkage. The casing is cross-linked to prevent buckling and to impart excellent mechanical strength due to high impact, indentation and abrasive resistance. The inner non-shrinkable HDPE layer is built into the middle section of TIAL-TUM system to prevent deformation. This extremely solid layer structure additionally reinforces the construction to provide full resistance to soil stress. TIAL-TUM is used together with TIAL-Z unique hotmelt adhesive. 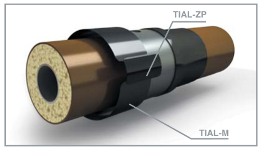 TIAL-Z serves for complete and long-term sealing of casing ends thanks to its high peel and lap shear strength. TIAL-Z is supplied as part of TIAL-TUM set preliminary cut for specific diameter. As an option TIAL-Z can be supplied in 30 m rolls. 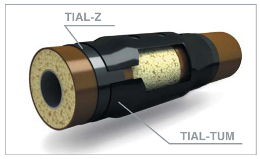 TIAL-TUM operates at environmental temperatures from - 60 to + 60 °С.Lifetime of TIAL-TUM casing is minimum 45 years. 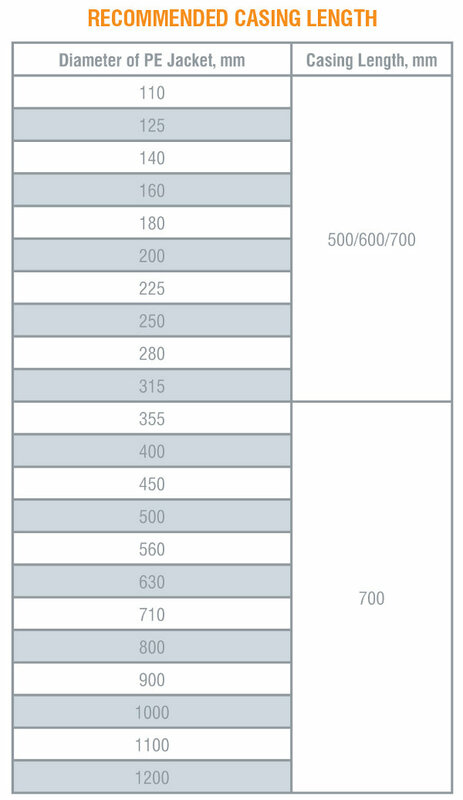 *Standard length can be changed upon customer request. ТIAL-М heat-shrinkable wrap-around sleeve is used for sealing of weld joint areas of pre-insulated pipelines. The sleeve has two-layer structure (PE backing and hotmelt adhesive). The backing provides with high indentation resistance, impact strength and extremely low moisture absorption. The backing is cross-linked to prevent tape from buckling and to impart specific mechanical strength and resistance to UV-radiation. Adhesive layer of the sleeve possesses high peel and shear strength. TIAL-M sleeve is fixed on the pipe surface with the help of TIAL-ZP fiberglass reinforced closure patch. The closure patch is delivered in set together with the sleeve. To ensure mobility of the works and to simplify logistic schemes TIAL-M sleeves can be delivered in 30 running meter rolls. The rolls are cut to the required length by installation crew on site. Nowadays heat-shrinkable all-in-one casings for sealing of pre-insulated pipeline joints are preferable. However when the carrier pipe sections has been already welded the tubular casing can not be installed. 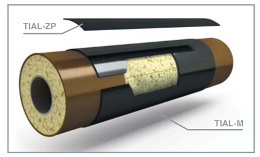 In this case TIAL-M wraparound sleeve is an indispensable product for coating of joints of pre-insulated pipes. Taking into account economical aspect, application of the sleeve is more preferable due to lower cost of the sleeve in comparison with one-piece casing. Additionally, time for installation process is greatly minimized. These both factors significantly reduce the cost of pipeline construction. When there are no strict requirements to hardness of the coating, TIAL-M sleeve is the ideal decision. Another means to replace all-in-one casing for sealing of joint areas of buried pre-insulated pipelines is PE or zinc-galvanized steel jacket application. The jackets impart additional hardness to the whole coating system for a joint. In this case TIAL-M sleeve is the ideal decision for waterproofing of the whole system protecting joint area. Qualitative sealing of joint areas is always an important goal during exposed pre-insulated pipeline construction. 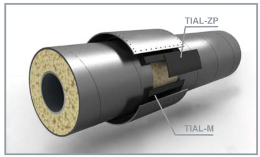 TIAL-M sleeve is optimal decision when the main coating of the pipeline is zinc-galvanized steel. In place where PU foam and galvanized steel contact each other there is often a problem to resist different speed of PUF and steel cooling down.TIAL-M sleeve eliminates this specific problem due to its high durability.